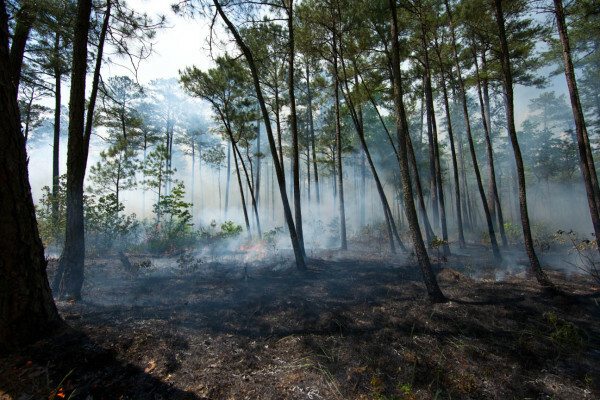 A low-intensity ground fire works its way slowly through the pine needles and other duff, killing hardwood saplings and low vegetation. Photo by Bryan Watts. When Dana Bradshaw first took me into the forest block in Sussex County, VA nearly 30 years ago, you could hardly find the pines. Owned by Gray Lumber Company, the site was overgrown with sweet gum, red maple, oaks, and hickories that dominated the look and feel of the forest. Red-eyed vireos, northern cardinals, Carolina chickadees, and red-bellied woodpeckers could be heard throughout the site. Although the location was identified by Charles Steirly in the 1950s as supporting some of the last remaining red-cockaded woodpeckers in Virginia, by the early 1980s the three remaining breeding groups were bound up in small, isolated pockets. Through a series of strategic purchases beginning in the late 1990s, The Nature Conservancy pieced together 3,200 acres that now comprise the Piney Grove Preserve with the mission of restoring the habitat to its former glory. Much has changed in a very short period of time. Smoke-filled pine woods on burn day. Photo by Bryan Watts. Beginning in the early 2000s with partners including the U.S. Fish and Wildlife Service, the Virginia Department of Game & Inland Fisheries, and the Virginia Department of Conservation and Recreation, The Nature Conservancy has introduced an aggressive burn program to mimic the frequency and intensity of historic lightening-strike fires that shape and maintain the pine savannah community of the Southeast. The response of the ecosystem has been remarkable. Removal of the hardwoods has allowed the site to breathe like the savannahs of the Carolinas, Georgia, Florida, and the other Gulf states. The ground is now covered with sweet pepperbush, Carolina azalea, bracken fern, and sweet bay magnolia. It is loud with the sounds of yellow-breasted chats, prairie warblers, field sparrows, summer tanagers, and brown-headed nuthatches. The preserve supports the northernmost population of red-cockaded woodpeckers, and the species is now thriving within this newly restored ecosystem. 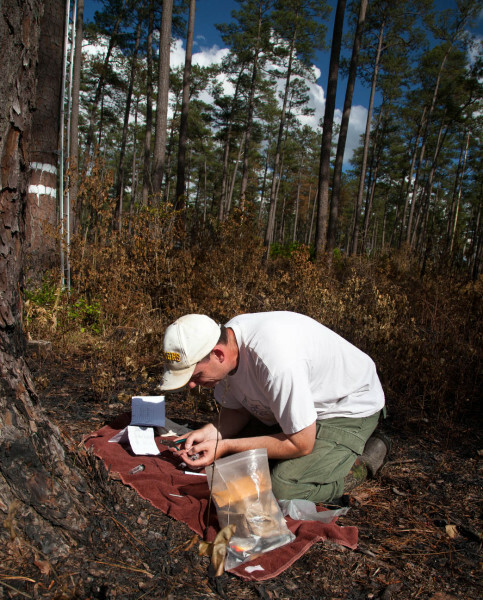 Surrounded by the charcoal of a controlled burn from just three days before, Mike Wilson bands a brood of red-cockaded woodpeckers. Photo by Bryan Watts. 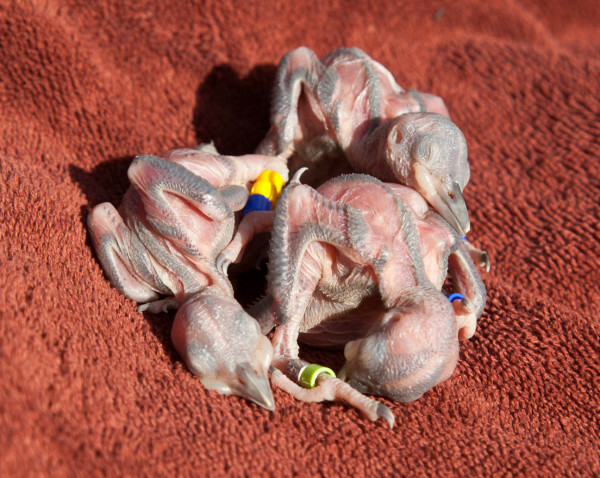 A brood of red-cockaded woodpeckers extracted from cavity for banding only three days after the territory was burned. 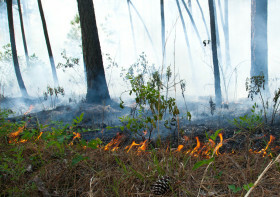 Red-cockaded and other species of the southern pine savannahs are fire-adapted and depend on regular burning to maintain critical habitat. They do well even with growing-season burns. Photo by Bryan Watts. 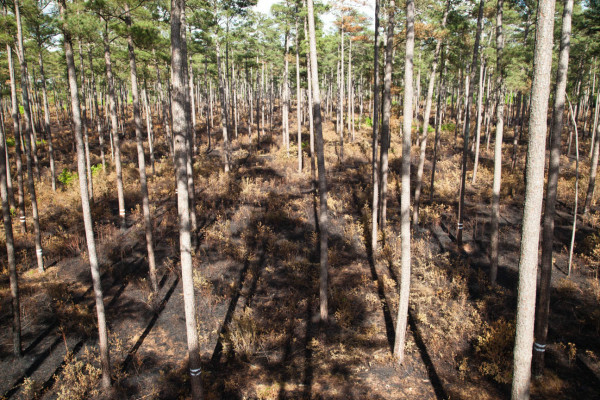 The re-introduction of fire into Piney Grove Preserve has pushed the forest back toward a different time. Fire disturbance has allowed the plants and animals that have evolved together to reassemble. The forest structure of the 1980s was more reminiscent of the Piedmont or Appalachians than the historic pinelands of the Coastal Plain. The Piney Grove of today has all the smells and sounds of the grand savannahs of the Deep South and the pineland birds have returned in force. Fire is a critical element of the ecosystem in this place. View of the open pine savannah from a nest cavity of the red-cockaded woodpecker just three days after a controlled burn. Photo by Bryan Watts.